As online college courses have become increasingly prevalent, the general public and college presidents offer different assessments of their educational value. Just three-in-ten American adults (29%) say a course taken online provides an equal educational value to one taken in a classroom, according to a March 2011 survey. 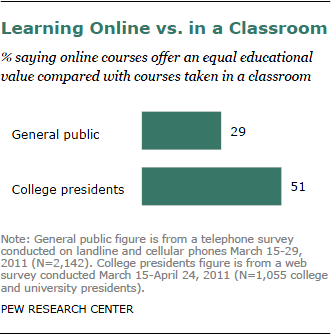 By contrast, fully half of college presidents (51%) say online courses provide the same value. More than three-quarters of the nation’s colleges and universities in the survey offered online classes. About one-in-four college graduates (23%) have taken a course online, according to those in the general public who were surveyed. Among those who graduated in the past decade, the figure rises to 46%. Adults who have taken a course online have a somewhat more positive view of the value of this learning format: 39% say a course taken online provides the same educational value as one taken in person, a view shared by only 27% of those who have not taken an online course.